Calvin and his snowmen were always my favorites. Calvin & Hobbes was the funniest damn comic ever. An animated show would have been so great for that. Nah, they were perfect the way they were; animating them would have destroyed the magic of Calvin and Hobbes. I love Calvin's snowmen. What an imagination. Two C&H threads on the main page....wow. Calvin and Hobbes is easily one of the best comics ever. 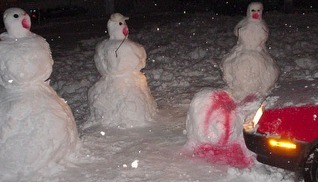 The Snowmen are some of the funniest and most creative. The Snow Sharks make me laugh out loud EVERY time I see it.